SCVHistory.com LW2922 | Magic Mountain | Clown Coaster, 1974. 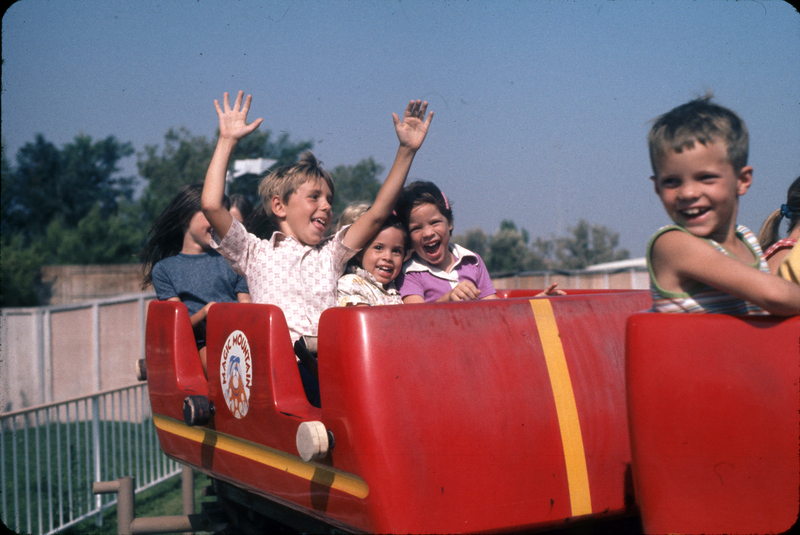 Kids get a thrill on the 10-mph Clown Coaster at Magic Mountain, 1974. 2x2-inch transparency (color slide film). This 350-foot-long, chain-lift, single-train coaster by Bradley & Kaye opened with the park in May 1971. Riders sat two across in two rows in each of three cars, for a total of 12 riders. Clown Coaster/Wile E. Coyote went into storage in 1999 but came out of retirement to join Goliath as one of three "new" coasters to open in 2001. Rebranded as Goliath Jr., it "was rebuilt and customized to look like the Goliath. ... The old supports were replaced with supports that resembled those found on the Goliath. The [train was] rebuilt from the chassis up, and it was repainted with Goliath's color scheme" (RCDB.com). The 2008 season saw another name change to Percy's Railway, then Magic Flyer after 2010. LW2922: 9600 dpi jpeg from original transparency purchased 2017 by Leon Worden.